Over 250,000 words to keep you up nights. Will kidnapping a sick woman alter the course of a nation? At CIA headquarters, officers fear that terrorists commandeered the computers to launch an unauthorized mission. Elsewhere, conspirators abduct seemingly unrelated people to use as pawns in their treachery. 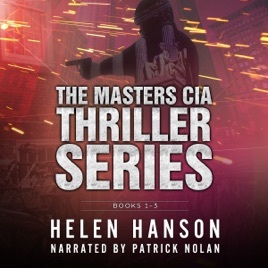 Two disparate ambitions - Clint Masters becomes the reluctant link in the chain of danger. After meeting a woman who doesn't treat him like a commodity, Beth unexpectedly disappears. In spite of the evidence, her family refuses to admit she's in danger. And without routine dialysis, Beth will die. While a CIA young gun tracks his quarry, Clint must find Beth before her kidneys fail. Someone wants Clint Masters to suffer and will burn down the city to get revenge. Clint's company makes devices that manage the city's infrastructure, making him a respected member of Boston's elite-until one of his products causes a deadly accident. While the public accuses him of terror, he's not allowed to reveal the truth about the tragedies. As his CIA contacts discover, not everyone at the Agency wants to expose the killer. Amid city-wide panic, the public demands Clint's arrest. He must choose. Does he go on the run to find the real terrorist or watch from a jail cell while his city burns? Hackers can access your bank accounts, take control of your car, or read your personal files. What if one gripped your beating heart? Whatever. Clint's got his own problems. As his city smolders from a saboteur's plot, Clint's company sinks in the morass. As the stock price tanks, it's not a problem he wants to face sober. When a medical hacker seizes control of the First Lady's heartbeat regulator, Clint's products pose a new threat. With their own on the line, the D.C. elite won't let Clint rest. They expect him to search for the one man Clint doesn't want to find. This time it's personal. But can he stop a bomber determined to commit mass murder?